Wedding cakes that offer amazing designs often take on the double role of dessert and decoration. A cake that combines several stunning elements into one design immediately becomes a focal point of the reception. The smooth fondant frosting, beadwork, and beautiful icing flowers are incorporated seamlessly into this cake, topped with two crowns. Topsy-turvy cakes are increasing in popularity. Choose one with bold colors for a festive look at your wedding. Simple patterns work best when both the shape and color is over-the-top. Skip the traditional fondant and buttercream cake and choose a massive sheet cake accented with berries instead. Guests will be amazed at the fresh flavor, and the size of a sheet cake that can feed hundreds of people. Combine bright colors with fresh flowers for an amazing cake. While pastels are pretty, guests will remember a bold turquoise long after their slice is eaten. Fresh flowers add a surprisingly natural element to the vivid frosting. A cake can be amazing not only for the decorator's skills, but also for his/her unique display ideas, too. The top tier of this cake appears to be floating amongst the flowers, but is actually held up by a clear vase turned upside down. Astound your guests by cutting into a cake that is taller than you and your spouse. Floating stands allow you to add dimension and height to your cake, with plenty of room for additional decorations on the table itself. Sometimes the simplest element can be the most amazing. The satiny finish of a cake iced so smoothly, it appears to be perfect, is simply stunning. Fondant makes this effect easy to achieve, so ask your decorator about using fondant on your wedding cake. Themed wedding cakes are truly memorable. Talented decorators can sculpt replicas of buildings, animals, cars and more for a truly amazing wedding cake. Prices are often higher for these cakes, so budget accordingly. Turn a traditional white tiered cake into an amazing wedding cake by adding more tiers and complex, elaborate decorations to the cake. Piping ruffles, roses and lattice onto a cake takes both time and skill. 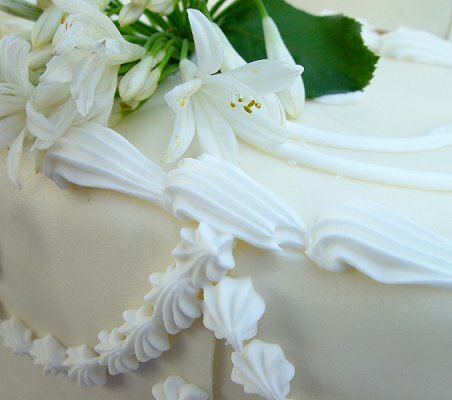 Regardless of the amazing wedding cake decorations, you must be sure to choose one that tastes amazingly delicious. Make sure your baker and decorator use quality ingredients and offer you a tasting session before you settle on a flavor and vendor for your cake. Need more inspiration? Check out our Pictures of Unusual Wedding Cakes.